ALKE' is industrial partner in the research programme COALINE funded by the EU. The main objective is the achievement of a in-line clean one-stage process, free of VOCs and small particle emissions, able to produce properly coated composite pultruded profiles. ALKE' is collaborating as industrial partner to the research programme COALINE funded by the EU having as objective the development of an innovative manufacturing process for the in-line coating of pultruded composites. The project is supported by an international consortium composed by 12 partners from 6 different European countries. 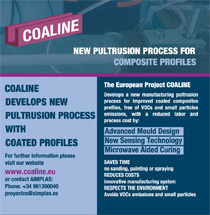 The COALINE project will develop a clean one-stage inline pultrusion process, free of VOCs and other small particles emissions and will produce properly coated composite pultruded profiles through the integration of specific sensing technology, advanced die design and microwave susceptors. The COALINE project will foster an improved composite/coating adhesion with reduced labour and process cost. COALINE profiles will be joined to other materials by means of an inline primer coating technology with debonding on-demand properties. Composites obtained by means of the COALINE technology will be fully protected from aggressive environments with the selected coating, with minor cost of the non-coated profiles in a fast, automated and smart manufacturing process, fostering the implementation of lightweight materials in applications such as aeronautics, automotive, marine, building and recreation. This technology will be applied to the ALKE' case study with the development of electric vehicles innovative chassis parts made by COALINE based composites. For more details on COALINE project see: www.coaline.eu. The COALINE project has received funding from the European Union Seventh Framework Programme (FP7/2007-2013) under Grant Agreement n° 609149.